Housed in a 300-year-old mansion, the Wuyuan Skywells Hotel brings ancient China to the present day. The property is located in the historic village of Yan village — a secluded town that is free of cars. Built during the Qing dynasty, the building is full of original architecture and artifacts most of which were preserved during its renovation. The interior now offers 14 guest rooms situated around one of three skywells. While they maintain authentic details like stone walls and intricate wood carvings, each one is fitted with modern amenities for a comfortable stay. An on-site bar and restaurant infuse Western influences into local specialties while the tea room showcases Wuyuan's wild teas gathered from the surrounding mountains. Located in Scottsdale, Arizona, the Otto Car Club is a hub for elite car collectors. The members-only club is housed in a 47,000-square-foot facility offering climate-controlled storage for your most prized possessions. Their main building can hold 185 vehicles while an addition 20 private storage garages give owner's 24-house access to up to 4 rides. 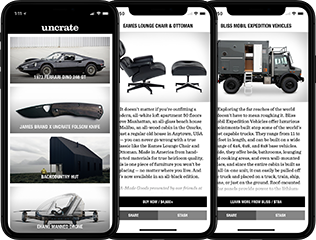 A smartphone app keeps your collection in the palm of your hand as well as notifying you about exclusive member experiences and events like track days and speaker series. Enrollment also comes with free reign of the lounge, private conference room, and dining room and perks ranging from car detailing to transportation. Rather than the sleek, modern studio spaces you'll find in the city, the This Old Hudson channels the century-old charm of its 1915 craftsman shell to provide a real escape from hectic urban life. The former residence is located in Upstate New York and offers two units that can be used for work, gatherings, or just a weekend getaway. The first is a two-bedroom studio while the other is a one-bedroom apartment featuring a 10-foot long farmhouse table. Both interiors are backdrop-worthy, brilliantly bringing together old and new with a curated collection of vintage furnishings and modern fixtures that'll persuade you to extend your stay. Surrounded by nothing but the Caribbean Sea, the Gladden Private Island Resort is the most remote spot in Belize. The two-bedroom hotel is the only villa on the island and it's all yours. Don't worry, you won't be completely deserted. A full staff is located on a smaller island nearby and are waiting to provide an all-inclusive experience. Just off the shore is the Belize Barrier Reef. The second largest in the world, the staff can arrange for boat captains to guide you through some of the best snorkeling and diving spots there is or you can paddle through the waters on your own. After a day of exploring or just lounging on the beach, allow the Le Cordon Bleu-trained chef to refuel you with a meal prepared from ingredients found right on the property. The island is situated just off the coast of Placencia and unlike most secluded getaways, it doesn't take half a day to get there. Gladden can be reached with just a four-hour flight from Miami. With its eight distilleries and surreal landscapes, Scotland's Isle of Islay is already a bucket-list worth location. But the current reopening of The Machrie Hotel & Links should move it up a couple spots. The property is situated on seven miles of beach on the Queen of the Hebrides. The renovation has brought 47 rooms and private lodges. Rather than traditional dark mahoganies and tartan prints, their aesthetic draws from Scandinavian design with soft white hues and minimal furnishings. Each room enjoys views of either the peat plains, the Mull of Oa, or the Atlantic Ocean while some have outdoor terraces that put guests within view of the greens. Along with the hotel, the property's 1891 golf course also received a renovation at the hands of course architect DJ Russell, allowing players the challenges of modern links among the historic setting. Part tent and part luxury cabin, the Domes Charlevoix put a futuristic spin on your wilderness getaway. The tree pods are perched on a mountainside in the forest of Canada's Petite-Rivière-Saint-François region. Inside, radiant concrete floors fade into the gray canvas walls, drawing the focus to the clear panel that overlooks the St. Lawrence River. Sleek black cabinetry creates a kitchenette, concealing the lower level bedroom while a boat staircase leads up to a sleeping loft. Situated on a wooden platform, each unit comes with a private jacuzzi where guest can soak in the impressive landscape. Built into the side of a former rock quarry, the InterContinental Shanghai Wonderland Hotel takes full advantage of its unique location. It's situated a short drive from Shanghai and features 337 rooms and suites spread across 19 stories, two of which rise above the surrounding landscape, and several of which dip below the surface of the lake formed at the quarry bottom. The soaring central glass atrium is meant to mimic a waterfall like the natural one flowing adjacent to the property. Underground, there's a watersports complex, pool, and restaurant while an extreme sports center is cantilevered over the quarry. With a green roof, solar panels, and geothermal energy, the entire project is environmentally-friendly.